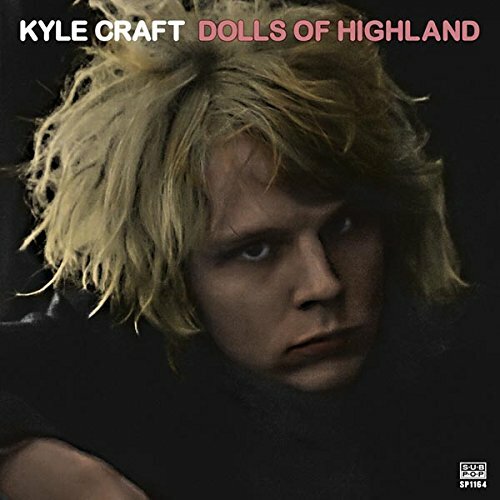 “This sounds like Ezra Furman, but with less of a cartoon comedy element“, my photographer mate Paul Reno informed me as Kyle Craft‘s Sub Pop label debut, Dolls Of Highland, played on my car stereo on our way to yet another gig somewhere in the Midlands. I can see what he means, though it hadn’t really occurred to me until he said it. To me, it just sounds as though Craft is steeped richly in the classic singer/songwriter values of the greatest performers of the seventies. David Bowie having a good natured food fight with Billy Joel, perhaps. Often, the formula seems to suggest a slightly more glam version of Mott The Hoople, his tunes bristling with an irresistible euphoria, while his intriguing lyrics are playfully astute. “Swing low, low sweet heathen / swing for the wretch and the rock and roll kid / roam this earth, repeat it / all this sin until this wicked world makes sense“, sings the Louisianian on the stirring ‘Lady Of The Ark‘, and I don’t think we need to delve too deeply to summise which recently deceased superstar might have been the template for THIS prose at least, do we? Craft sets his stall out with intent from the off, ‘Eye Of A Hurricane‘ erupting splendidly like something from Ziggy Stardust, and one thing becomes increasingly apparent throughout – that this guy, without a shadow of doubt, has one of the most fitting surnames in the business right now. Craft relays his tunes to us through something of a carnival atmosphere, perhaps best evidenced on the aforementioned ‘…Hurricane’ and the tellingly titled ‘Berlin‘, another glorious romp through glam rock’s once fallow wastelands, but seemingly now an oasis of riches in this composer’s hands. These are boisterously exuberant beer swilling anthems, make no mistake, and guaranteed to register highly on the feelgood High Strike machine, should you ever find yourself at something of a low ebb. Do not let me dupe you, however, into believing that this is some kind of Bowie-by-numbers copyist. He is definitely not that. It’s just that he incorporates the cream of that bygone era so vividly that’s it is impossible not to draw the comparison, and the truth is, Craft’s uncompromising, loud and piercing vocal style is as captivating as it is relentless. In more restrained, reflective moments, such as ‘Trinidad beach (Before I Ride)‘, Craft calls to mind latter day Beatles, specifically some of the great Harrison penned standards of the era, before the mop top’s Traveling Wilburys ally Bob Dylan is unmistakeable as the obvious influence for the slow rockabilly shuffle of ‘Future Midcity Massacre‘. In summation, Dolls Of Highland is an absorbing, electrically charged, beautifully composed album that will do more to lift your mood than a train carriage full of amphetamines. Lovely stuff.